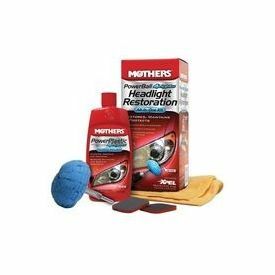 The Mothers® PowerBall 4Lights® Headlight Restoration Kit is designed to quickly and safely restore, maintain and protect all types of plastic headlights. When used with the included polish, the PowerBall 4Lights® easily cleans away yellowing and stains, and even buffs out unsightly hairline scratches, smudges, and flaws in a single step. It restores crystal clarity; leaving behind a tough, protective, oxidation-inhibiting polymer layer to guard against future degradation from the elements. Kit Contains: 1. Polishing Tool 2. 8 oz. Polish 3. two Restoration Pads 4. 15" x 15" Microfiber Towel The Mothers® PowerBall 4Lights® Headlight Restoration Kit is designed to quickly and safely restore, maintain and protect all types of plastic headlights. When used with the included polish, the PowerBall 4Lights® easily cleans away yellowing and stains, and even buffs out unsightly hairline scratches, smudges, and flaws in a single step. It restores crystal clarity; leaving behind a tough, protective, oxidation-inhibiting polymer layer to guard against future degradation from the elements.